TORONTO, Ontario, Canada, August 14, 2013 (ENS) – Production of heavy crude oil from the Alberta tar sands is Canada’s fastest growing source of greenhouse gas emissions, and if expansion continues as government and industry project, they will cancel out every other effort to mitigate emissions, Canadian experts told reporters today. Emissions from the tar sands are projected to double by 2020, which will send Canada’s greenhouse gases way over the 2020 climate change target it shares with the United States. Canadian experts hosted the press call today to release a new report, “Mitigating climate impacts of the tar sands: political and policy barriers to greenhouse gas reduction in Canada,” that shows successful mitigation is unlikely. “Mitigation of Canada’s increasing carbon pollution is incompatible with the Harper government’s policy of unchecked oil sands expansion, which is driving their push for Keystone XL,” said Dr. Mark Jaccard, professor of environmental economics at Simon Fraser University and former chair of British Columbia Utilities Commission. “The Canadian government has failed to rein in the skyrocketing emissions from this carbon intensive industry and we are now at a point where the only acceptable alternatives for the U.S. government to reject Keystone XL,” said Jaccard. Because the Keystone XL pipeline from Alberta to Nebraska would cross the Canada-U.S. border, President Barack Obama must issue a Presidential Permit for the pipeline based on whether or not it is in the U.S. national interest. The U.S. State Department has been assessing whether or not that is the case, but it has been hampered by questions about the contractors selected to do the assessments. Both contractors, first Cardno Entrix and now, Environmental Resource Management, a Washington consulting group, have come under fire for their unreported ties to TransCanada, the Alberta company that proposes to build and operate Keystone XL. The Canadians on the teleconference agreed that the Keystone XL pipeline is essential to expansion of tar sands production. Other pipelines, or transport by rail of the product, bitumen diluted with chemicals to make it liquid enough to flow in a pipeline, would face insurmountable obstacles to approval, they believe. All the Canadian speakers are opposed to further tar sands development and said they were encouraged by President Barack Obama’s statement during his climate change speech at Georgetown University June 25 that his approval of the Keystone XL pipeline would depend on its impact on the global climate. “The net effects of the pipeline’s impact on our climate will be absolutely critical to determining whether this project is allowed to go forward,” the President said, calling on the United States to lead international efforts to combat a changing climate. Models show that in order to curb tar sands pollution and meet Canada’s shared 2020 climate goal with the United States, regulations on the tar sands would have to establish a price on carbon of at least $100 per tonne. But any meaningful regulation is highly unlikely, said Canadian experts. 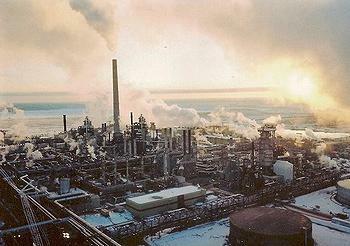 “It will be very difficult for the Canadian government to achieve its own emissions reduction target for 2020 even without tar sands expansion, and more so if it continues to pursue tar sands expansion,” Dr. Danny Harvey, a climate scientist at University of Toronto, told reporters. “In any case, deep reductions in overall emissions, beyond the 2020 target, will be required in the following decades that will be impossible to achieve if we lock in 40 years of increased tar sands emissions by building more pipelines,” said Harvey. 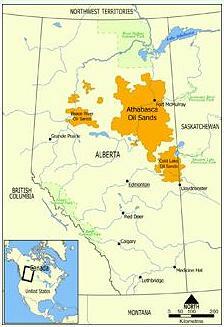 Many countries other than Canada are active in Alberta oil sands mining and production. They include: China, France, Japan, Norway, South Korea, the Netherlands, the United Kingdom and the United States. Canada’s Conservative government headed by Prime Minister Stephen Harper has made many public promises to curb greenhouse emissions, but no federal regulations on emissions from the oil and gas sector have yet been proposed in Canada. As a result, the scientists said, Canada likely to miss its international climate commitments by a margin greater than all of the carbon produced by the combined emissions of Canada’s power plants or the combined emissions of all of Canada’s passenger vehicles. May said greenhouse gas emissions from the tar sands are growing in two ways. First, producers are “digging up more bitumen to mix with toxic diluants and ship to other places,” she said. Also, emissions per barrel are growing as oil sands producers are shifting from open pit production to in situ steam injection production, May explained. As President Obama has traveled around the country over the past several months, Keystone XL pipeline protesters have demonstrated whereever he has appeared – in Phoenix, Arizona on August 6, in Jacksonville, Florida on July 25, in Warrensburg, Missouri on July 24, in Washington, DC on July 22, and many other places. About 200 environmental activists from three environmental groups protested the Keystone pipeline in front of the State Department Monday, staging a sit-in confronted by dozens of law enforcement officials. The protesters did not try to enter the building, and no arrests were made. In July, 55 activists were arrested during a sit-in at Environmental Resource Management, protesting ERM’s conclusion that the pipeline would not have a negative environmental impact. Climate change campaigners on the teleconference today praised the Obama Administration for regulating greenhouse gas emissions from cars and power plants while urging Canada to follow suit.